The steep West Face is relatively easy to reach but only one route exists, a scramble on good rock. 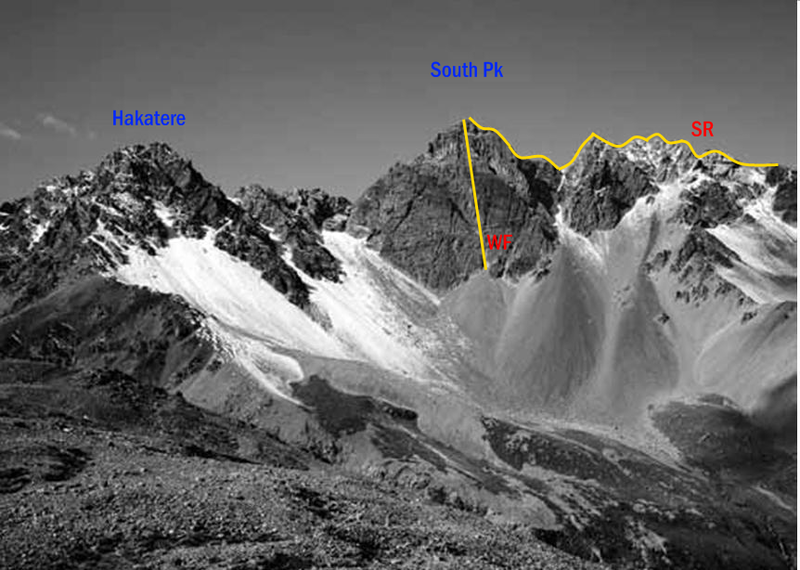 Climb the spur on the northern side of the creek that joins the Lawrence River immediately north of Hermitage Hut. Gain the high col overlooking the South Ashburton Valley and follow the rock ridge northwards. The first narrow arête can be traversed or turned on a series of ledges to the west, and broken blocks lead to a final short traverse to the summit over an exposed, narrow ridge of very loose argillite – many parties stop at this point. Best attempted from the hanging valley that joins the main valley a short distance up the lateral moraine. Move up over glaciated slopes to gain the ridge overlooking the Lawrence, slightly south of the summit. Broken blocks lead to a final short traverse to the summit over an exposed, narrow ridge of very loose argillite – many parties stop at this point. Follow the top of the lateral moraine above the Ashburton Glacier to the basin between South and Hakatere Peaks. Follow a snow slope and very rotten rock to the summit. Sidle into the basin below South Peak and head to a gut between the summit and the first gendarme to the south. After climbing the gut, follow the last section of very rotten ridge to the top. From the col between Hakatere and South Peak, climb the ridge. 2 short pitches.